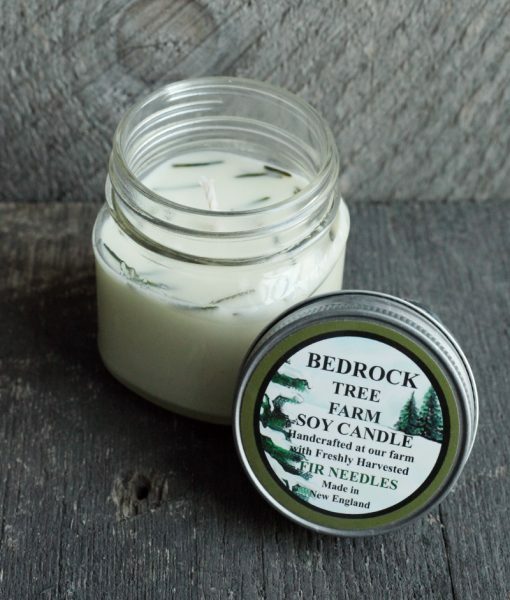 Bedrock Tree Farm’s signature natural Fir Needle soy candle is scented with real fir needles and powder with added essential and fragrance oils in soy wax. 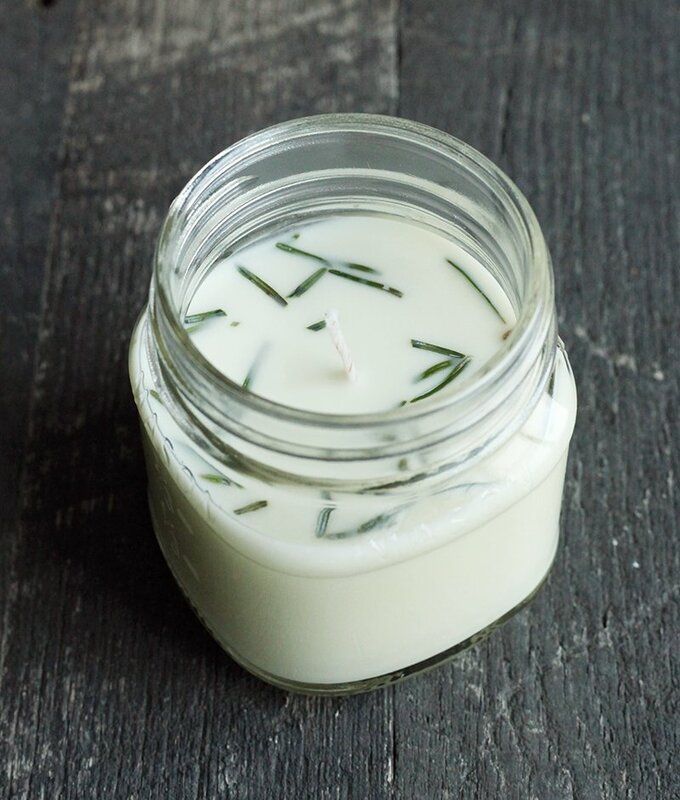 Real fir needles are mixed throughout the candle and float around entertaining you as you enjoy your candle. 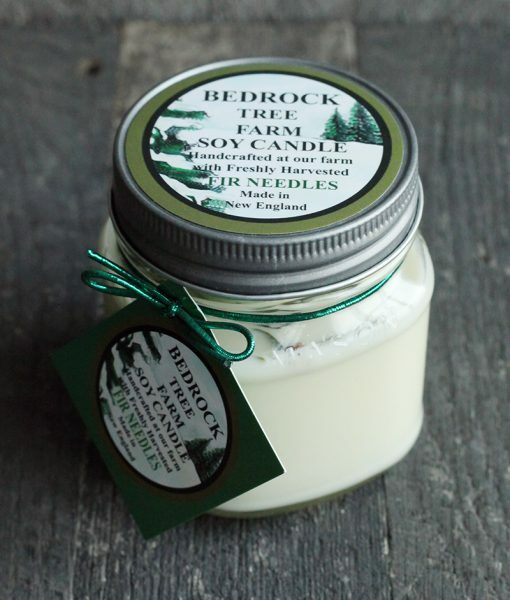 The smell is like no other pine or fir needle candle you have ever had! You will feel like you are walking through an evergreen forest when you burn this candle. This 8 oz. mason jar fir needle soy candle is handcrafted at Bedrock Tree Farm in Wakefield, Rhode Island using fir needles harvested from their own trees. Each candle contains certified pure essential oils, phthalate free fragrance oils, and dyes that are formulated with eco-friendly ingredients. All wicks are cotton. The candles are made from 100% soy wax derived from soybeans grown in the USA. There is an enormous amount of information about the differences in a soy wax candle and a paraffin candle. Although soy is superior to paraffin in many ways, the clearest, most undeniable difference is that soy wax is a renewable source, making it the clear choice over paraffin for that reason alone. Bedrock Tree Farm is one of our farm partners. It is so rocky that it’s difficult to tell if there are more rocks or trees on their farm! You will not regret buying this candle… in fact, you may regret not buying more! 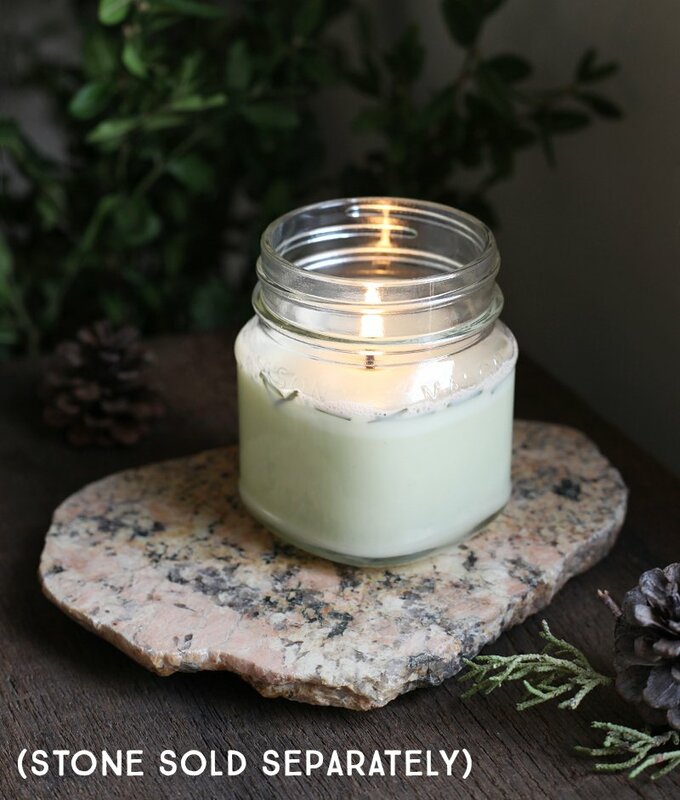 It pairs wonderfully with one of our fieldstone coasters, or smaller Food Slabs as a base upon which to burn the candle – and makes a charming gift set! - Always burn candles on protected, heat-resistant surfaces designed for candle use. Shop for a stone base here! - Discontinue burning candle before the wax level reaches the bottom. - Burning the wax below 1/2" level may cause the container to break or burn. - Extinguish all candles when leaving the room or before going to sleep. Never leave a burning candle unattended. - Keep candles out of the reach of children and pets. Do not place lighted candles where they can be knocked over by children, pets, or anyone/anything else. - Keep burning candles away from anything flammable, such as furniture, drapes, bedding, carpets, books, flammable decorations, kitchen cabinets, etc.